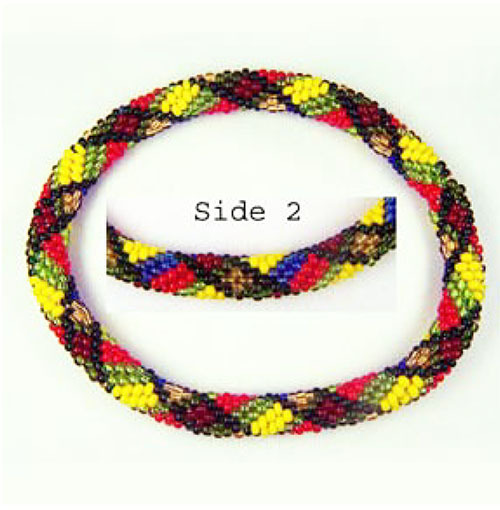 Based on the MacMillan Scottish Plaid, this bracelet uses a bead crochet slip stitch and nine colors. This band creates a plaid illusion, which is based upon the traditional MacMillan clan plaid. Instructions include the Need for Beads’ Easy Start method of starting the tube, as well as a beading graph, word map, and instructions for the invisible join. As long as you know how to hold a crochet hook in your hand and crochet a slip stitch, you have everything you need to be successful with this pattern.